I finally got around to my painting project. I started out painting in the sinkhole but after dropping wet paint heads on my shirt twice Tim ordered me out of the couch and to the table. pah, sitting up. overrated if you ask me. I love the painted wood German Christmas ornaments so much and wanted to try to make a little something like that for the tree this year. So I went to Michaels and got some round doll heads and candle cups from their painted wood stuff aisle and this is what I came up with. I painted some jingle bells for buns and hot glue gunned the pieces together. I tied string through the back of the bell buns and they hang on the tree okay. They lean forward a little but if they’re hung up high it works. Looks like they’re looking down at you. I need to take some photos of the rest of our wonky Whoville tree today. First I’ll have to clean up the clutter so I can take a full tree shot and you can see it’s crookedness in its full glory! when my husband gets home from work tonight, i’m leaving him with the sick children and going to go get supplies. imitation is the sincerest form of flattery. right? those are the most awesome ornaments I’ve seen yet. this is so cute! so well made, bravo! p.s. all of this coming to you from my sinkhole. oh, holy Xmas! they are soooooooo sweeeeeeeeeeeet! i looooooooooooooooooooooooove them! nice job! so cute! You have such great ideas. Oh my! These are really adorable! Isn’t hot glue gun an awkward thing to turn into a verb (should it be “hot glued” or “hot glue gunned” or “hot glue shot”)?!! cute and creative as always! genius! love the bell-hair! enjoy the couch! So cute – what a great idea!! So adorable! I’m impressed youare getting anything done at all. When I’m pregnant I like to nap. running to Michaels RIGHT NOW! These have busted through the stratosphere of cutedom. Love them so much! I was going to do something similar except with the candle cups face up. It never occurred to me to use them upside down. And the jingle bell buns – genius! these are my favouritist ornaments ever. Great job! the hair kills me, sooo cute hillary! You are so clever – they are just adorable! Can’t wait to see your crooked tree! Very cute ornaments! And Congratulations on your pregnancy! That’s awesome! (I’m a little late reading this time of year.) I hope you are feeling better very soon!! And congrats on the new little bundle in the oven. I bet your crafty ideas are brewing in the baby department. Hope your feeling better, soon none the less. Awwwww…. Those are TOO cute! I never cease to be amazed at how creative you are. These are so totally cute! Holy bell-buns, Batman! Those are cool!! How in the world do you even come UP with this stuff??!! Long time reader, first time commenter! Those are ADORABLE! oh i love these little ladies! Seriously, Hillary, you really knock me out with all your ideas. Totally Cindy-Lou Who! Those are truly wonderful and they’re saying “baby girl” to me (though I too think two boys are fun). Congratulations and thanks for PTB#2, spaceboy is done and I’m working on the robot. my god, you’re right, they are so very ‘whoville’. I so love that! I have a 3 foot tree and these will look so cute!! thank you for all the wonderful ideas!! congrats on the new baby-to-be!! Hope you feel better real quick!! I know I shouldn’t swear in a blog comment, but the f-word is coming out loud and strong. sweet baby lord, I CAN’T restrain myself. this are so good, sooooooooo good, so good! this is what you do when you still feel sick? good god woman! ADORABLE!!! You just keep hollying along sweetheart! I LOVE LOVE LOVE all you do! I was wondering what you’d do with those wooden candle holders. Very clever and cute! Congratulations on your pregnancy!!! Holy cow those are cute. You inspire me to go out and try things after all the time I spend just looking at the cute pictures. Keep it up! They are adorable! Totally adorable. The bell buns are so sweet. Congratulations on your pregnancy. Wow, i love them! 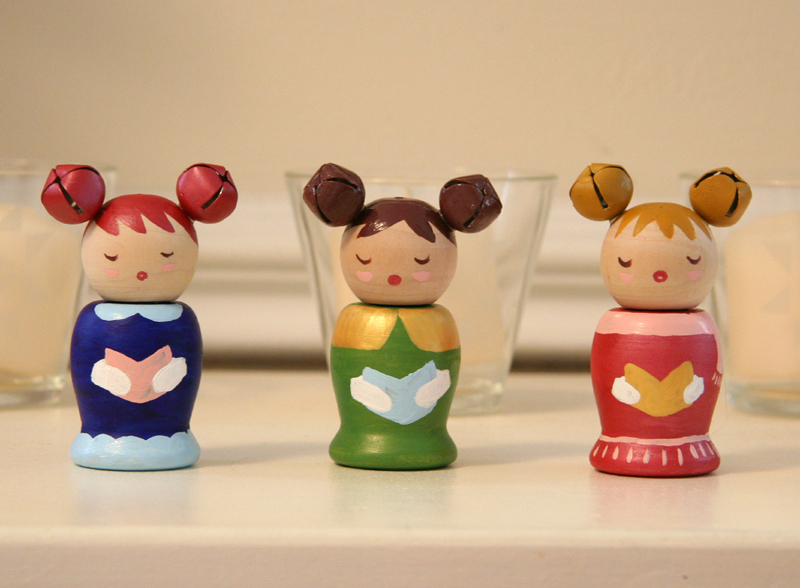 Everybody´s painting little wooden girls: Posey has some adorable Lucias! And i have my little princesses 😉 But yours are simply lovely! And congratulations on your pregnancy: i´ve just found out! So good! They are so adorable, I love the buns! You are so talented. crooked or no, they’re cuties! Yes, where DO you come up with these ideas? Cute. Very cute. okay, I know I’m just piling on at this point but those are adorable. Those are awesome and I want to give a try with it as well but my painting it very good. I love your ornaments! Thank you for the inspiration and the incredible creativity! Are you kidding me? Those buns are PURE genius! OMG I LOVE THEM!!! The jingle bell buns are ADORABLE!!!! MUST FIND TIME TO MAKE THESE (maybe next year!)!! 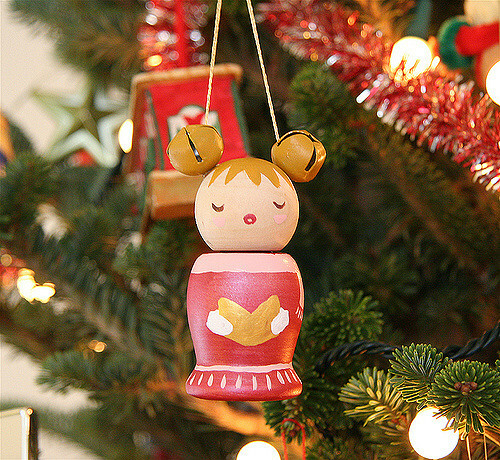 I love the wooden ornaments too, but yours are SO cute! Hrm, maybe I’ll hit up Michael’s tonight! “Jingle Buns” YOU KILL ME! These are so beyond awesome. Thanks for sharing! Kawaii with a capital E! I can hear them singing, I swear! I am always delighted when I visit your blog – your ability to turn simple things into incredibly cute creations astounds me. Thanks for inspiration!